At Wellness As Rx we offer many different modalities of massage therapy. We specialize in relaxation treatments, Thai massage, myofascial, Swedish, deep tissue, and athlete specific treatments. Swedish massage is a very relaxing modality that helps to reduce stress and muscle tension . It is performed using oils, creams, and lotions with the client undressed and respectfully draped with sheets and towels. This includes a combination of various compressions and strokes done with and without oils and creams. Some people believe that deep tissue massage is supposed to be very painful. This is not true. Working deep muscle tissue can be very effective without pain when approached the right way. Due to the use of oils, clients undress before treatment. Sheets and towels are used to cover all areas not being worked on. 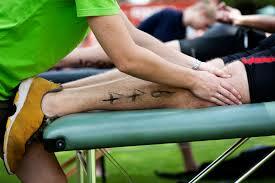 Massage is great for before or after a sporting event. Pre-event is not a time for relaxing or deep work. We work with athletes using techniques to help tonify muscles and prepare them for the event. Post-event relaxation is okay but really deep should wait about 3 days. Passive and active range of motion techniques can also help clients to recover faster. Thai massage (Thai Bodywork or Thai Yoga) is a unique and efficacious form of massage that was first introduced over 2500 years ago. Thai massage is also referred to as “Nuad Boran” in Thailand, which translates to “ancient massage”. It is considered energizing , yet meditative and relaxing. It is also a great modality for anyone looking to reduce pain, expedite recovery, reduce stress, increase range of motion, or aid in injury prevention. It’s like doing yoga without having to do the work. The therapist takes clients through various poses and stretches while applying compression to muscle tissue, tendons, and acupressure points. Thai bodywork is traditionally done on a cushioned floor mat. The client remains fully dressed and is encouraged to wear or bring comfortable yoga or gym clothes. Lomi Lomi or “Hawaiian massage” is best known for long, flowing strokes, using the forearms and generous amounts of oil. Traditional lomi lomi always includes abdominal massage because Hawaiian tradition considers the colon part of a person’s soul or heart. Often, more of your body is uncovered during this massage than during a typical Swedish or deep tissue massage. The more traditional draping practice is that the therapist uses no sheets, covering your private areas with small towels and/or breast towels. That’s because therapists rarely massage one body part at a time. Instead, they move in long flowing motions that, for example, may start at the top of your shoulder and go all the way to your foot. Another example may be using one hand or forearm on your shoulder while simultaneously massaging a hip with the other hand or forearm. Russian massage is a massage therapy technique developed in the former Soviet Union. Russian massage techniques are similar to sports massage, but they involve much slower, softer motions. Draping for Russian massage is minimal in comparison to Swedish or deep tissue massage. Russian massage includes range of motion exercises that are uncommon in other massage techniques. These practices target unused areas of the body and are similar to the stretching practices in yoga and Thai massage. Russian massages focus on the use of friction to generate heat within the body. The therapist combines this with vibration and flowing strokes to ease muscle pain and stiffness. It also helps to relieve mental stress. Our entrance is on the lower level on the back of the building. All massage therapy sessions are by appointment only and available at our studio. To save time before your appointment. Print and fill out our client intake form. Purchase gift certificates and packages from our online store.